HELP! I Think I'm Screwed! Email or fax me your mixer and I'll do the repair. Return by same as sent. If it's still broken when I get it back from the repair shop, I'll definitely take you up on your offer. While sitting here thinking about my mixer in the repair shop, I was wondering if I could do something to prevent a recurrence of the problem. I thought I may have been using too big a recipe and causing undo strain on the gears. I started to reread the manual. 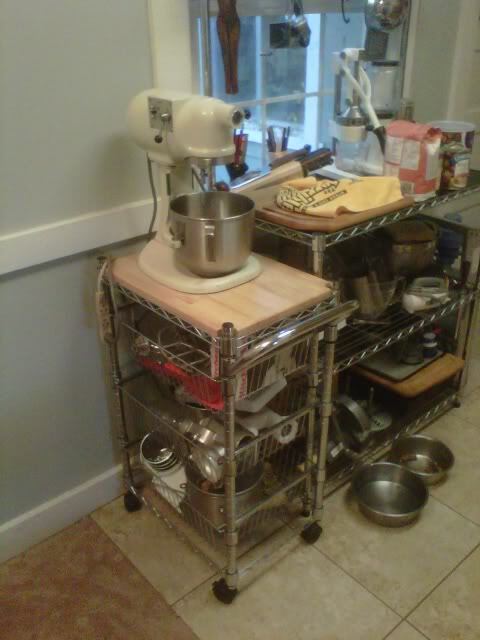 The bread making section suggests no more than 10 cups of AP flour or 8 cups of whole wheat flour for a 5-quart mixer. I use 1100 grams of bread flour (just a hair over 9 cups). So it looks like I am in the ball park for quantity. However, I also came across the following statement: "Do not exceed speed 2 when preparing yeast doughs as this may cause damage to the stand mixer." Oooops! I always make my bagel dough at speed 4. Do any of you observe these limitations (or equivalent for your mixer?) when making yeast dough products? Aha! You have been abusing your KA! Now the truth comes out. Waterboarding it in the commode. Overexerting it. For shame, Andy. And now I'm paying my debt to the mixer gods in the form of a check made out to the repair service. I always run Lucile on speed 2 when making bread. I have not come close to her 14 cup capacity yet (I am tempted to give it a go though). Lucille is a 6-quart, right? Do you run it on 2 because the manual said so or was that your determination? She is the Pro600 and the manual said to run no higher than 2, and there was lots of threatening words about voiding warranties and calling Mixer Protective Services and such. I will say for bread making I see no reason to run it faster.